Richard Schmidt thinks he has a boring story, but that couldn’t be farther from the truth. The technical specialist for industry giant Tarkett started his career in the floorcovering industry more than forty years ago as helper at a furniture and carpet company. Schmidt was in his mid-20’s when he took this crucial step in his life. Before that he worked in construction as a carpenter building homes, apartments and commercial structures. He hopped from job to job trying to see what he liked. In 1976, during a terrible cold snap that saw 56 days below freezing, he spent one too many days rough-framing houses. “Looking across the building site and seeing journeymen installing carpeting in a warm space struck me as an attractive alternative,” he laughed. While working at the furniture and carpet company, Schmidt started a side business with a coworker in 1979. Eventually the two opened a small business and moved into commercial focusing on main street installation. After a few years the two went their separate ways and Schmidt started his own company. When completing a project for a local post office, the landlord of the building approached him, professing that he was incredibly impressed with his dedication and quality. “I can’t find one seam anywhere in this entire space,” he said. The building owner was a union contractor and the next thing Schmidt knew he was getting asked to bid out work. He originally picked small projects here and there but eventually completed larger projects and did work for other union contractors in the area. He became a signatory (Carpenters 170) in Youngstown, OH in the mid-1990s. Through industry connections Schmidt eventually met Tim Provence. Provence was working with Armstrong Flooring at the time, and the company was looking for a Midwest installation manager. Schmidt got the job and worked with the company for several years. When Schmidt left Armstrong, he reunited with the same union contractor from the post office project and started working on the road. While it was a great opportunity at the right time, Schmidt was contacted by Tarkett, which had just purchased Johsonite, a year earlier. They were looking for a dedicated technical specialist and knew he was the right person for the job thanks to the success he had with product certification programs at Armstrong in conjunction with INSTALL. 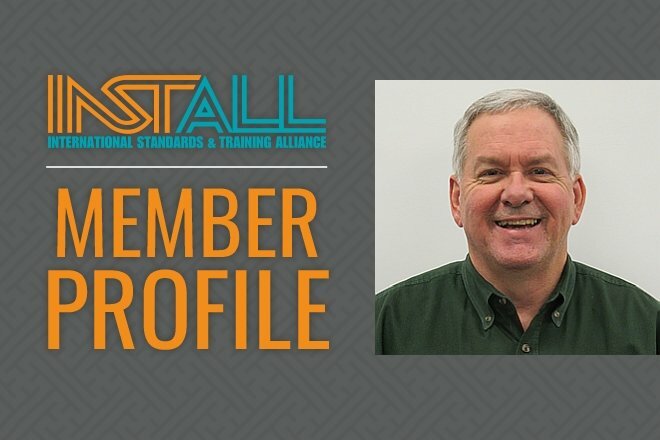 While Schmidt got his feet wet with INSTALL at Armstrong, his involvement grew once he took on his role at Tarkett. Johnsonite was a charter member of INSTALL, along with Armstrong, meaning there was strong support from both ends and an understanding of the value behind the INSTALL name.